For thousands of years, the marshes at the confluence of the Tigris and Euphrates rivers in modern day Iraq were an oasis of green in a dry landscape, hosting a wealth of wildlife. The culture of the Marsh Arab, or Ma'dan, people who live there is tightly interwoven with the ecosystem of the marshes. The once dense and ubiquitous common reed (Phragmites australis) served as raw material for homes, handicrafts, tools, and animal fodder for thousands of years. Distinctive mudhif communal houses, built entirely of bundled reeds, appear in Sumerian stonework from 5,000 years ago. Now that culture is drying up with the marshes. Recent decades have brought extreme change to the fertile lands famous for the birth of agriculture and the rise of some of the world's earliest cities. 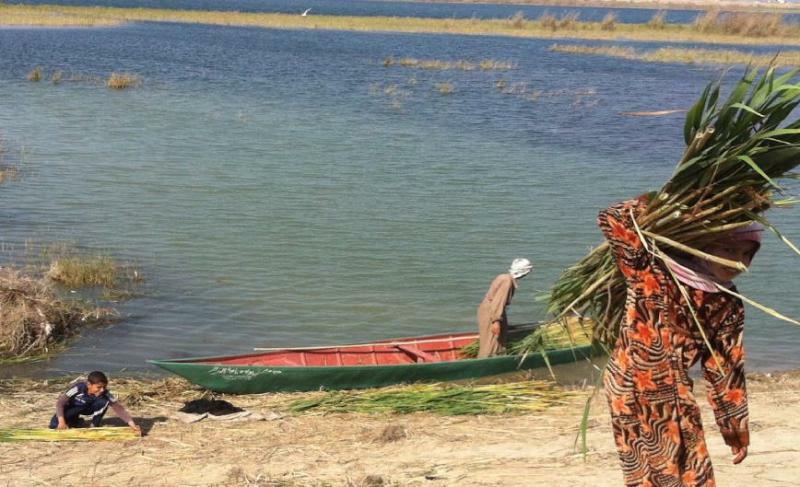 The sphere of daily life for Marsh Arab women has shrunk as the natural resources they traditionally cultivated have vanished, reports an international team of researchers in "Effects of Mesopotamian Marsh (Iraq) desiccation on the cultural knowledge and livelihood of Marsh Arab women," published today in the March 2016 issue of Ecosystem Health and Sustainability, a joint journal of the Ecological Society of America and Ecological Society of China. The study is the first effort to specifically document Marsh Arab women's cultural relationship to marsh ecological services. "Imagine the Everglades. The Marsh Arabs used to live in the middle of the water, surrounded by everything green. The fields, the reeds, and the water buffalo were around them. Now they have to walk five, ten kilometers to reach resources. The land is dry and brown," said study author Nadia Al-Mudaffar Fawzi, an Iraqi marine ecologist who returned from New Zealand to the city of her birth in 2009 to teach and conduct research at the University of Basrah. The Mesopotamian Marshes in 2000 were mere remnants of their former glory, after a decade of deliberate drainage. The white area shows the extent of the marshes, once the largest in the Middle East and an important destination for migratory birds, in 1973. Credit: United Nations Environmental Programme. "When I came back in 2009, I knew there were lots of problems with drying of the system. We knew there was big impact on fish production, on water quality in the Shatt al-Arab, and in the north of the Gulf," said Al-Mudaffar Fawzi. In her investigations of the water systems, she also grew interested in the social impact of environmental change, and in people's understandings of the effects of the environment on their lives. Iraq did not have environmental laws until the change of government in 2003, and they remain a low priority in the current chaotic conditions in the country. "The whole situation in the marshes is completely different from what I saw before, in the '70s and early '80s," she said. "Women used to play a role in the ecological system. They used to work with men in gathering reeds and in fishing, and we would see them in the market when they come and sell their produce, like the fish, and the milk from the buffalo, the cheese and the yogurt that they make." "The older women who were adults before the war would tell us, 'back then I was out making dung patties, collecting reeds, taking care of buffalo,'" said author Kelly Goodwin, who works with the international NGO Millennium Relief and Development Services. "They say, 'now I'm just at home'." Goodwin interviewed 34 women, ranging in age from teenagers to more than 70 years, in the Hammar Marshes north of the city of Basrah in December 2013-February 2014. More than half the interviewees were over 50. These older women were born and grew to adulthood before the war in the 1980s and destruction of the 1990s. Nearly 60 percent of younger women under 40 described their days as exclusively "domestic." 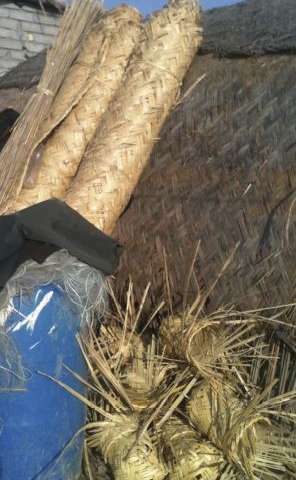 Reed mats and pigeon homes, ready for market, lean against the side of a reed house. The production and sale of handicrafts is traditional work for Marsh Arab women. The common reed (Phragmites austalis) is a cultural and ecological keystone species of the Mesopotamian Marshes. Lack of water has made this once abundant raw material scarce. Credit: Kelly P. Goodwin. Although men and women have separate roles in Marsh Arab culture, traditional women's work took women outside the home and brought supplementary income to the family through market sales. 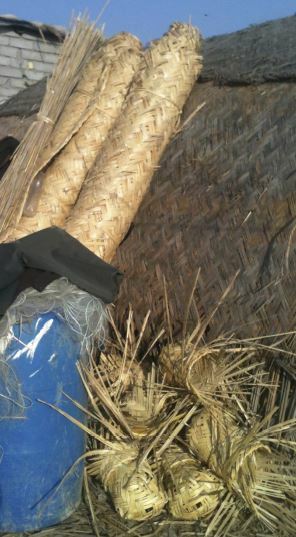 Women cared for water buffalo and gathered reeds to weave into mats, baskets, pigeon cages and other tools. Women turned high-fat buffalo milk into dairy products, dung into fuel, and raise chickens, cattle, and sheep. They helped cultivate rice, wheat, and dates. Usually women, not men, took fish, dairy, and handicrafts to sell in city markets. "The marshes were a cultivated landscape, shaped by selective harvest, hunting, fishing, and burning to promote the natural resources that the Marsh Arabs used—much like the precolonial landscape was cultivated by native peoples here in California," said author Michelle Stevens, a professor California State University in Sacramento. Also like California, Stevens said, climate change modeling predicts a future of hotter summers, accentuated droughts, and shrinking winter snowpacks in Turkey's Taurus Mountains, where the Tigris and Euphrates rivers arise. In Iraq, war and ongoing political instability have magnified the problems besieging marshes worldwide, particularly in arid landscapes: pollution and too many demands on the water that sustains them. The marshes enjoyed a burst of recovery the mid-2000s after drying up nearly completely in the previous decade. The influx of water, and resulting dramatic greening, can be seen in images from NASA's Terra satellite, captured between 2000 and 2010. The resilient reeds returned quickly as the marshes rehydrated. Water in the Tigris and Euphrates has dropped to 20 percent of the pre-war volume. The remaining water carries so much salt that it is often undrinkable. Drought in 2007 hit the region hard, reversing many of the restorative gains for the ecosystem. The generation of Marsh Arabs that grew up outside the marshes had no practical experience of living in the marshes, and struggled to adapt to the lifestyle of their parents' youth. Recovery of the ecosystem and culture of the marshes will likely depend on diplomatic efforts to secure sufficient water, Al-Mudaffar Fawzi says. In Mesopotamia Marshlands National Park, Iraq's first national park, restoration practices are emerging that appear to successfully restore social and ecological systems, and could be used as templates for restoration in other areas of the Mesopotamian Marshes. But this cannot be done without water. "It was extremely sobering sometimes to see the circumstances some people are living in," said Goodwin. "Much of the land near Basrah city is desertified." But visits to the marshes could also be thrilling, she said, and the visit to the restored region was almost magical. "I really consider it was a privilege to sit with these women, drink tea, and hear their stories," said Goodwin. "I would have loved to have tangible solutions to take back to them that could encourage the retention of cultural traditions and secure ecological restoration. I think they feel they are forgotten and overlooked. I wish I could tell them that they are not forgotten."